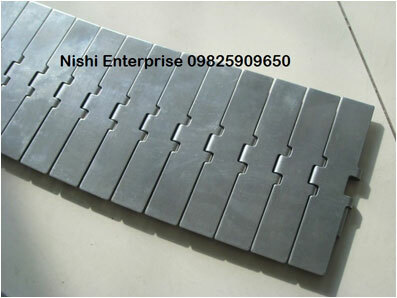 Nishi Enterprise is a designer and manufacturer of top grade slat chains that are used by companies in all parts of the world. Our slat chains are used for different kinds of mechanical transmission projects. 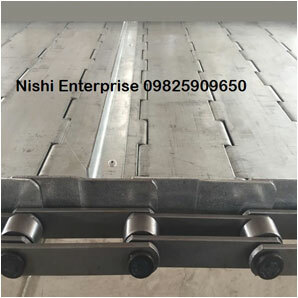 Whether you are looking for straight-running slat chains or radius/side-flexing slat chains, you can find the finest products by getting in touch with us at Nishi Enterprise. The good thing about our slat chains is that they are quite flexible and versatile and therefore can be used with most sprockets and systems that are available these days. When you get our slat chains, you can be sure of the fact that they are perfectly compatible with the current industry standards. This makes them truly perfect for retrofitting. Slat chains work as units within a conveyor system that makes use of different kinds of interleaving segments for creating slat type chains. Mainly synthetic polymer products or stainless steel materials are used for their construction. The slat chains are made in either friction grip styles or as low friction components. The slat chains are used extensively in various high wear and tear areas. In many cases, handling individual cans or packets are used for bottling or filling operations. The slat chains are also widely used in different types of food manufacturing applications. The heavier versions of slat conveyors are seen in the freight handling applications as in these cases the level of impact and the loads are quite high. The traditionally heavy and compact slat conveyors are crafted with the help of hardwood slats that are fixed onto the parallel chains. As one of the leading designers and developers of slat chains in India, we adhere to the best industry practices that enable us to make sure that all of our products are of the highest quality. When you get in touch with us to buy our top notch slat chains, we can take into consideration your specific needs and then guide you to products that are best for you. We can also provide you with custom slat chains that can deliver you powerful output every time you use them.